News. I'm never eating cauliflower in any other form from now on. Nope. Only in this exact soup, as it's too good to waste cauliflower on anything else. If you've been looking for an extraordinary cauliflower soup recipe you've come to the right place. I don't mean to brag but...ohmygod. How is it that cauliflower can be shaped to taste soooo good? It's straight up magical, you guys. I seriously had to put this soup away as soon as it cooled, because I kept slurping it from the ladle as I passed by. That's when you know you've made a great soup. It's luxurious and silky. 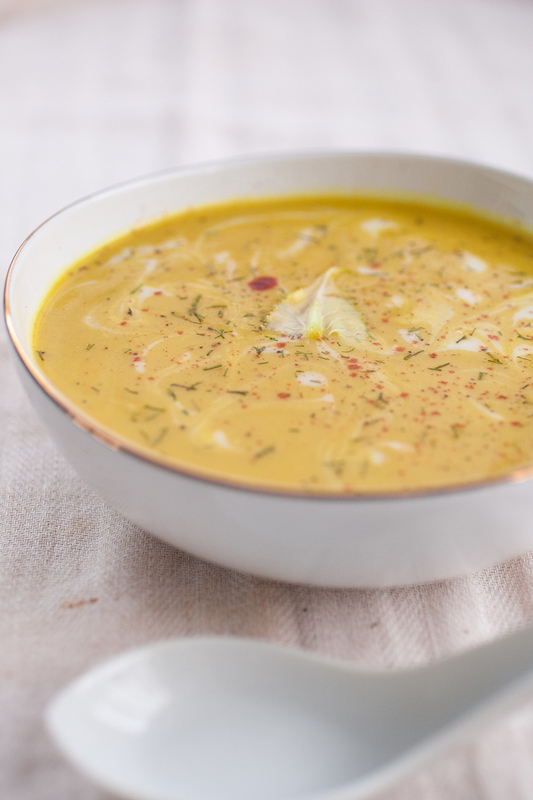 This coconut-creamed cauliflower soup is infused with aromatic spices like cardamom, cumin, coriander, and turmeric. So good, it's the only cauliflower soup you'll ever want to make. On a separate note, it's been almost a week since I've ran! Yoga has taken over my life. I downloaded Yoga Studio (has a lotus flower logo) on my phone (I'm in no way affiliated) and I am obsessed! I did yoga in a studio yesterday and then after work came home and did one on the app too. You should check it out! Also, my compass pose is improving! Hurray! Notes: I like to freeze unused canned coconut milk to use later. In fact for this recipe, I used frozen milk that I thawed. Or, place in the fridge and use over oatmeal or in smoothies. Be careful, turmeric stains everything. In a large soup pot, heat the oil over medium-low. Add all the aromatic ingredients, except for the garlic. Saute, stirring occasionally until the onions become translucent, about 10 minutes. Then, add the garlic and saute another few minutes. Add the sustenance ingredients and bring to a boil over high heat. Reduce to a simmer and allow to cook for about 15 minutes, until the cauliflower is tender. Remove from heat and transfer carefully to a blender. Blend on high (allowing steam to vent) for a few minutes, until silky and smooth. I feel like it's important to note that the songs I post here are completely unrelated to my life. I just post what I'm jamming away to during that time. Just, an FYI. I don't want any, "Why's your heart broken!?" comments. It's not. No worries, my dears...it's just a catchy song. Listen and chair dance with me! Good Deed of The Day: Sign this petition to demand that China crackdown on people who buy tiger products and watch their execution, it's just awful.